In 2016, students from the University of Leeds have been working in collaboration with the Dales Countryside Museum. The aim of the project was to reconnect scholarly resources, including the Leeds Archive of Vernacular Culture held in the Special Collections at the University, with the communities on which they provide information. Hawes is one such place. Their chosen topic was one very dear to many people in the local area: Oatcake. This classic baked staple is firmly embedded in the tradition and history of the Yorkshire Dales. 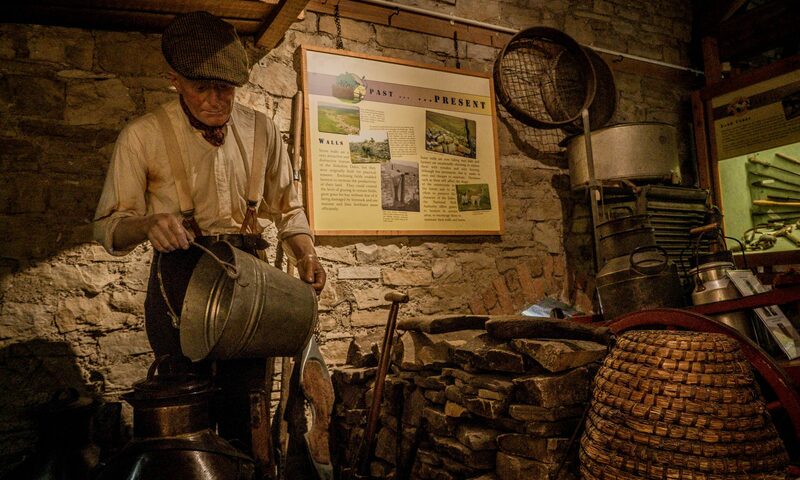 The museum honours their importance with a display that immerses you in an authentic country kitchen setting, and details their historic baking method. In the following digistory, local history expert and farmer’s wife Eleanor Scarr gives her thoughts on, personal experience with and a general history of the oatcake tradition. It is accompanied by photographs belonging to Marie Hartley and Joan Ingilby, who established the museum. The students aimed to find out more about how the oatcake has moved into the 21st Century. What better way than to come to Hawes and speak to some of the locals? Below are extracts from the interview with Eleanor Scarr. Catherine McCarthy is the owner of Mrs McCake, the cake decorators. She grew up in Burnley, Lancashire, but more recently moved to Hawes to open her baking business. Richard Elijah is owner of the Elijah Allen & Son grocery shop on the high street in Hawes. We’d like to hear from you. Send us pictures of your finished oatcakes, and any thoughts you have on the process, to us on Twitter @DalesMuseum, using the hashtag “#oatcake”. Also, if you have any special baking traditions that have been passed on through your family, or any interesting stories about baking, please let us know. Do you have any unique words that refer to baked goods, or items in the kitchen? How did your parents or grandparents do things in the kitchen? Are oatcakes, or any other foodstuff, important to you? Please leave your thoughts in the comments section below.